Blogging for gold is a A to Z guide for amateur , professional bloggers and hobbyists , who want to learn how to start and blog . How to build content and then how to make money from your b logging niche . ‘Blogging for Gold‘ is a beginners guide on how to blog. It’s divided into 60 chapters. Each being short and crisp. The book talks about the apps you’ll need to complement your blog, the mistakes of beginners and the importance of social media. How it now has in certain aspects become even more important than traditional media. Anuj Tikku talks about advertising, affiliate programs and how to monetize your blog. This book also has a portion on ‘bloggers block‘ and how to deal with it. I appreciated this portion quite a lot as not many acknowledge this problem. What went wrong for me was that while guiding us how to blog it strayed away talking about ‘how to write pulp fiction‘ or ‘how to self publish‘ etc. Also, portions like ‘if Arjuna was a blogger’, ‘women rule the social media world’ and a few more chapters had absolutely no content to offer on the topic. Also, it went back and forth on topics. Like ‘Affiliate marketing bloggers holy grail‘ was on chapter 49 while ‘The key to winning affiliate marketing game’ was on chapter 56. The chapters in between were ‘how to write a self published book’, ‘who’s a social influencer’, ‘women rule the social media world’ etc. which caused reading difficulty. It could have been avoided and was definitely a sign on lousy editing. All over Blogging for Gold is a good book to help you understand the dynamics of blogging and give you a upperhand as a beginner. But it could have been better. It gets a 3.5 stars from me. “Blogging for Gold” is available in E-book. Popular Instagram cartoonist and Muslim-American Huda Fahmy presents a hilarious, relatable, and painfully honest new collection of comics that break down barriers and show how universal our everyday problems, worries, and joys actually are. At some point in our lives, we’ve all felt a little out of place. Huda Fahmy has found it’s a little more difficult to fade into the crowd when wearing a hijab. In Yes, I’m Hot in This, Huda navigates the sometimes-rocky waters of life from the unique perspective of a Muslim-American woman, breaking down misconceptions of her culture one comic at a time. From recounting the many questions she gets about her hijab every day (yes, she doeshave hair) and explaining how she runs in an abaya (just fine, thank you) to dealing with misconceptions about Muslims, Yes, I’m Hot in This tackles universal feelings from an point of view we don’t hear from nearly enough. Every one of us have experienced love, misunderstanding, anger, and a deep desire for pizza. In Yes, I’m Hot in This, Huda’s clever comics demonstrate humor’s ability to bring us together, no matter how different we may appear on the surface. The book through its illustrations, portrays the stereotyping of the religion and subtly calls out on the hypocrisy/double standard of people and media. It calls out on how terribly wrong and faulty the Muslim Reps are in movies and how there’s not enough women of colour on-screen. Huda Fahmy points out how people are always ready with unwarranted half boiled judgements on Muslim men and women alike. And pass on insensitive generalised comments on how Muslim men are controlling and how Muslim women are unfree and dominated – all based on JUST a piece of clothing. She also talks about the regular bullying she is subjected to for being a Hijabi! At the end the book has a Glossary that provides us with simple meanings of ‘dreadful’ terms like ‘Allahu Akbar’, ‘Gehad’, ‘Halal’, ‘Hijabi’ etc. ‘Yes, I’m Hot In This’ is available in Hardcover and E-book. Quite comprehensive and an useful guide for all freelance Mums to help you manage work and personal life better. From here Annie Ridout very slowly and extensively goes through the sections on how to set your daily routine around your baby’s nap time to how to brand yourself and spread the word out. She guides you on how to efficiently switch your mum mode to work mode back and forth and really has a substantial portion on how to divide your day. She talks about the very touchy and tricky topic of money. Of how to decide a rate and on how to negotiate it. I’m really impressed on how rigorous this study is and the real life experiences from so many freelance mums adds the cherry on the top! ‘The Freelance Mum’ is available in Paperback and E-book. From the popular Instagram project, @HiddenHeartbreak, comes a book for anyone who’s had to get over an ex, offering honesty, laughter, and a reminder that you’re not alone. 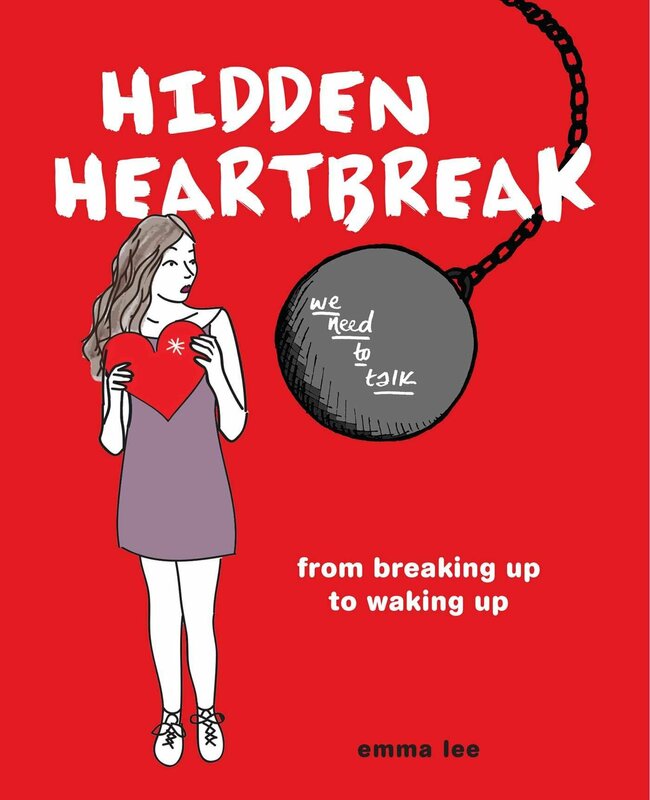 Hidden Heartbreak is a graphic novel featuring the course of an affair that ends on a bad break up. Though it claims to portray the “progression of a doomed relationship from blissful beginning to devastating end”, there was no blissful beginning to begin with! Only the “all blinding euphoria of love” that makes you ignore all the red flags that were present from the very start. The illustrations were pretty good and definitely funny and relatable for anyone who’s been foolish in love. Who’s ever tried to nurse an emotionally unavailable soul and have been devastated when their love-potion did not work. It’s for anyone who has struggled over a break-up. There were even activity sheets in-between for reader’s participation. It enquired from what were the first signs we ignored to what closure meant to us. I felt it was pretty thoughtful. But the book was unnecessarily long that resulted in repetitive illustrations. Also, I felt the punch was missing somewhere. All over the book was nothing amazing to stick with you. But also, it was not bad. I’ll give it a 3.5 out of 5. ‘Hidden Heartbreak’ is available as Paperback and E-book.